For many, a summer wedding is a dream come true, and on that special day for those we love, we go the extra mile to make it as special as possible for them. Here at Aspinal of London, we've picked out a choice selection of bespoke and personable wedding gifts. It's often so difficult to pick the perfect gift, yet whatever your budget, you'll find only the highest quality items that will remind the bride and groom of their special day forever. With our signature personalisation and luxury gift wrap services, it's never been easier to impress. On a day when everyone is picture perfect, guests and hosts alike posing for the professional photographer, what better way for your beautiful bride and groom to remember their special day by, than gifting an equally beautiful Kensington Wedding Album to keep those cherished memories safe. This Italian calf leather bound album, gold tooling on the spine and covers, complemented by Aspinal's double contrasting ribbon page markers. 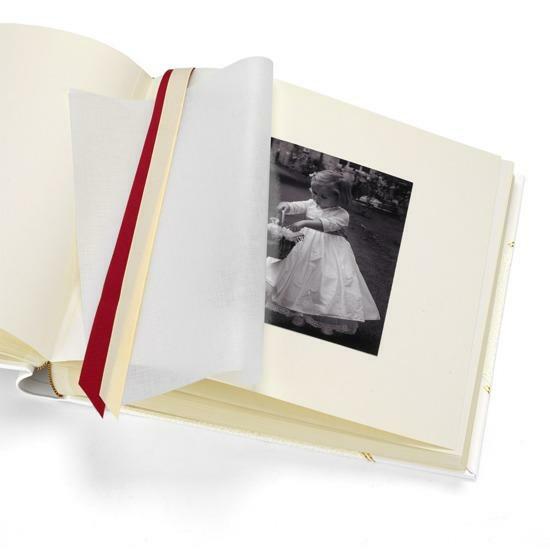 With its acid-free, cream card pages interleaved with pH balanced tissue pages. Those special photos will be luxuriously protected for a lifetime. Our master craftsmen can emboss names and dates with gold foil, for that personal touch. It's so easy for gifts to be impractical or quickly forgotten and gathering dust, make sure you find the thing that they'll never put away. Here at Aspinal, provide the bride to be with a superb centrepiece that she'll be proud of. This stunning Savoy Jewellery Box made with our signature Berry Lizard print Italian calf leather with contrasting soft suede interior. 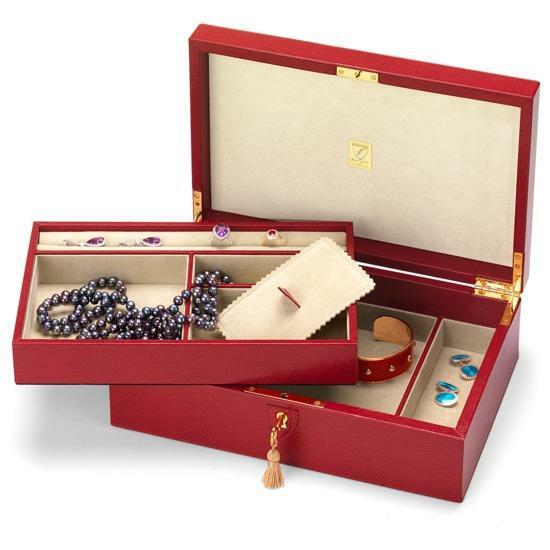 Featuring multi-level storage for all sizes of jewellery, a 10-inch ring roll, solid brass hinges and lock for extra security. This decadent, versatile and sublime piece of homeware will never leave the limelight. Personalise with golden embossed initials for a real bespoke feeling. Gifts for men are challenging under normal circumstances, let alone on their wedding day. Typically, practicality comes first, and we at Aspinal have a range of luxurious items to suit even the hardest to impress grooms. 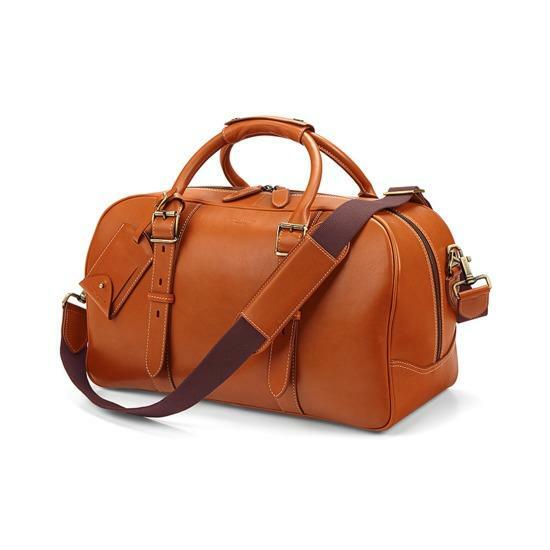 Our Small Harrison Weekender Travel Bag won't just go with them on their honeymoon but have the timeless aesthetic and longevity to be with them for years to come. Both perfect for work and leisure; boasting a fully adjustable shoulder strap, our durable patented leather with comfortable twin handles and brass feet for protection. This cabin sized style icon will never be far from his side. Here at Aspinal of London, our designers strive for perfection, and on that special day, the bride deserves only the best. 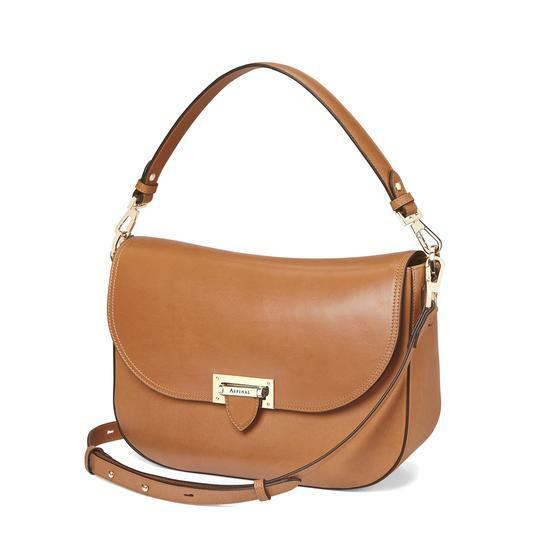 The Letterbox Slouchy Saddle Bag from our most popular range, now available in the finest Smooth Natural Tan Italian calf leather, is a style icon and is the epitome of a modern classic. A flawless wedding present for the bride on her special day. Either blind or gold embossed, those small details make for a truly personable impression.